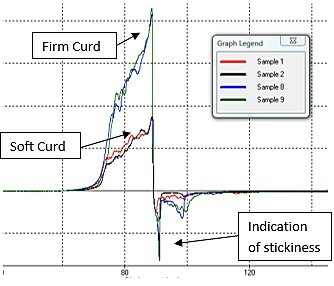 Dairy companies need a way to consistently measure and therefore, control the textural attributes of cottage cheese curd. Consumer desires for the texture of this product can vary considerably by geographical locations. The process of cooking the curd for cottage cheese has a great effect on the texture of the finished product. Because of this, the process is under constant manipulation in order to produce a consistent product. Additionally, the way a consumer views a good product varies geographically. For this reason, the product must not only be consistent, but tailored to what is desirable to the consumer. 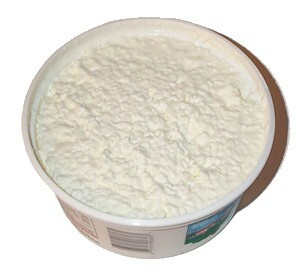 Texture is very important as cottage cheese is almost entirely evaluated on this characteristic. Before testing, samples were allowed to stabilize to room temperature (about 72 FÂ°). A given amount of product was weighed and then placed in a standard shear, often referred to as the Kramer Shear Cell. For cottage cheese, the thin blade version is used due to the smaller particulates in the product. All testing was done using the TMS-Pro at a speed of 250 mm/min. As the upper blades moved down, the cottage cheese was first compressed and sheared through the bottom of the cell. The force required to deform the product gives a good indication of the textural properties. Measurement of the texture gives the process operators valuable feedback on the process to improved quality.